The Eastern Partnership approaches its tenth anniversary in May 2019. 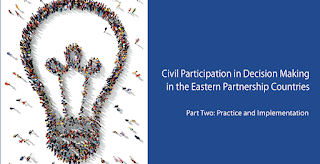 On 26 February, in Brussels, the Eastern Partnership Civil Society Forum launched the latest Eastern Partnership Index, edited by New Diplomacy Chair Jeff Lovitt. In the introduction to the Index, Jeff Lovitt set out some of the big policy challenges facing the EU and the Eastern Partnership countries in 2019 and beyond, noting that the Association Agreement signatory countries are now implementing Deep and Comprehensive Free Trade Area agreements with the EU, and have all secured visa-free short-term travel to the Schengen countries, but that "their aspirations of closer alignment with the EU are far from assured". The following encapsulates some of the main points of the introduction to the Index. Although the Index data covers 2017, the narrative also covers developments to the very end of 2018, and the recommendations (see the Top Challenges for 2019 below) look forward to 2019. The parliamentary elections in Moldova on 24 February 2019 resulted in a stalemate, and there is evident concern that the ruling Democratic Party (PDM) will connive to continue in power, and to perpetuate its leader's stranglehold over the economy and the judiciary. We now face first presidential, then parliamentary, elections in Ukraine, a country where substantial reforms have been implemented (not least local government reform), but where the fight against corruption continues to face entrenched interests of powerful business interests. On the other hand, the Velvet Revolution in Armenia has raised hopes that civil society and new political forces can turn the tide against entrenched interests. Below, after the Top Challenges for 2019 listed in the Index, some of the introduction's main points on justice reform and conflict de-escalation are shared in abridged form. The governments of the Eastern Partnership countries must focus on the professionalisation and independence of the justice system, and the EU should make financial support to the respective governments strictly conditional on prompt and comprehensive reforms of the judiciary and prosecution service, and genuinely independent anti-corruption agencies. The freezing of EU assistance to the government of Moldova should continue until a government emerges that shows a commitment to tackling this challenge with integrity. Where financial assistance to government is frozen, support to civil society should continue, indeed be strengthened, in the EU’s new multi-annual financial framework. There is an urgent need for strong EU support for civil society and independent media in all six countries, including Belarus and Azerbaijan, where the media are least free. The EU and NATO should build on the decisions of the Warsaw NATO 2016 Summit to restore confidence in Europe’s security architecture. The EU can also take a lead on easing tensions and launching dialogue to resolve the territorial disputes in the region and the conflict in eastern Ukraine. The democratic progress made in Georgia and Ukraine is far from complete, and the energy of the Velvet Revolution in Armenia must be sustained. The EU and international donors can empower civil society to not only monitor the implementation of policies, including the spending of EU financial support, but to become an active partner in shaping EU programme assistance priorities. EU support is also essential to enable civil society to undertake comprehensive, country-wide monitoring of elections to ensure that there is no democratic slippage. powerful groups, the EU should apply strict conditionality and freeze all financial support to those governments. Hard choices must be made, but in the end strict conditionality will be necessary, and it is unacceptable for both EU taxpayers and for the citizens of the EaP countries if EU financial support goes to governments where the state has been “captured” by corrupt business groups. Different models of support might include long-term engagement of experts who have directly turned around justice systems in other countries rather than secondment of experts to review the existing or planned legislation and processes. The EU and other donors need to recognise that such reforms need to be hard-hitting. Where there is political resistance from entrenched interests, the money would be better spent on supporting democratic actors working to hold the authorities to account rather than supporting reforms where the political will is lacking. The conflict in Ukraine needs a comprehensive approach, including the stabilisation of economic and democratic development, and a pre-emptive approach to guarding Ukraine against external economic risks, primarily from Russia. The EU can help in these security areas, just as it can in Georgia to equip the government to resist the Russian military’s constant extensions of the territory of the secessionist-held Tskhinvali (South Ossetia) region further into Georgia-controlled territory. Diplomatic efforts should be intensified to enable the EU Monitoring Mission in Georgia to be given access to Abkhazia and South Ossetia. The increase in contacts between the governments of Armenia and Azerbaijan, including a communications hotline that has been accompanied by a reduction of the number of incidents around Nagorno-Karabakh, are an important development. While this progress emerged after the emergence of the new government in Yerevan, the democratic changes in Armenia do not mean a solution to the conflict with Azerbaijan will be found quickly. The resolution of the competing rights and demands of the Armenian and Azerbaijani communities that both lived in the autonomous territory before the war of 1988-1994 will require an ambitious, sustained mediation effort to open up dialogue and facilitate reconciliation. However, the scope for a de-escalation of tensions is now a realistic objective, and the window of opportunity should be embraced. The EU is well placed to take a lead on launching such a dialogue, with a view to at least de-escalation of tensions in the case of Nagorno-Karabakh and the other territorial disputes in the region. With France as one of the co-chairs of the OSCE Minsk Group (the others are Russia and the US), the EU already has a place at the table, and should maximise its diplomatic engagement to build on the recently improved communications between the two countries. The EU should strengthen its presence in the region and improve its in-country intelligence-gathering so that it is better prepared when both internal and external shocks materialise. Better staffed delegations should be combined with more resources and mandates for EU Special Representatives, such as the Special Representative for the South Caucasus and the crisis in Georgia. 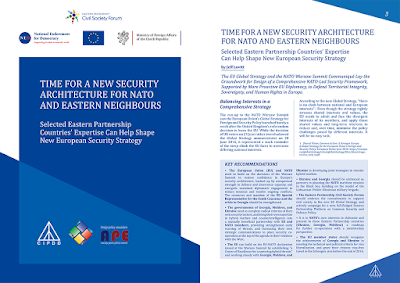 The EU Global Strategy needs to be complemented by clear objectives and a Common Security and Defence Policy (CSDP) strategy that intensifies co-operation with partners in the EaP countries and builds adequately resourced early warning systems. Will Moldova – in an Election Year – Lose Its Crown as Pace-Setter in the Eastern Partnership? Parliamentary elections are scheduled to take place in Moldova in November 2018, not long after the next Eastern Partnership Index is due to be published. Between now and then, the current tug of war in Moldova is likely to intensify – not just between President Igor Dodon's tilt towards Russia and the stated pro-EU policies of the current government, but also between those who value an active civil society and those who would rather independent civic actors kept out of politics, between those who cherish a diverse and independent media and those who want a media that backs their political and business interests, and between those who want an independent judiciary and prosecution service versus those who would prefer to continue to enrich themselves at the expense of the public purse. This is not a split based on geopolitical orientation (there is even collusion between the so-called pro-Russia and pro-EU forces, for instance on pushing through the change to a mixed electoral system, strengthening the hands of business interests in the new single-member seats), and the future democratic trajectory depends on new political actors emerging, either to form government or to work intensely with civil society and independent media to hold the government to account. Sound familiar? Yes, it could be said of other Eastern Partnership countries too (we all know that Ukraine and Georgia have their own problems with the nexus of political power, media, and business). The latest edition of the Eastern Partnership Index covered the first year of the Association Agreements between three EaP countries (Georgia, Moldova, and Ukraine), and saw Moldova retain its leading position, but a more comprehensive picture will be available in the next edition of the Index, due to be published in September/October 2018. Just as Ukraine had a later start with the new trade arrangements (the bilateral Deep and Comprehensive Free Trade Area agreements with the EU), so the forthcoming index will also reflect the fact that Georgia and Ukraine have caught up with Moldova in securing visa-free travel to the Schengen zone. After a pause to refine the methodology, not least to reflect the increased importance of sustainable development, human rights, and security in the region, the new Index rests on two dimensions: Approximation and Linkage. What was formerly known as the Eastern Partnership European Integration Index (last edition 2014, published in 2015) has been transformed into the Eastern Partnership Index. The new Eastern Partnership Index (the 2015-2016 edition – Editor in Chief: Jeff Lovitt) is now published and online, events were held in Brussels and Kyiv recently, and more will follow. The results show that the entry into force of the Association Agreements brought about considerable headway in integration with the EU in the case of Georgia, Moldova, and Ukraine within the period covered (the data takes in developments until the end of December 2016, although the narrative shows the full picture until the end of 2017). 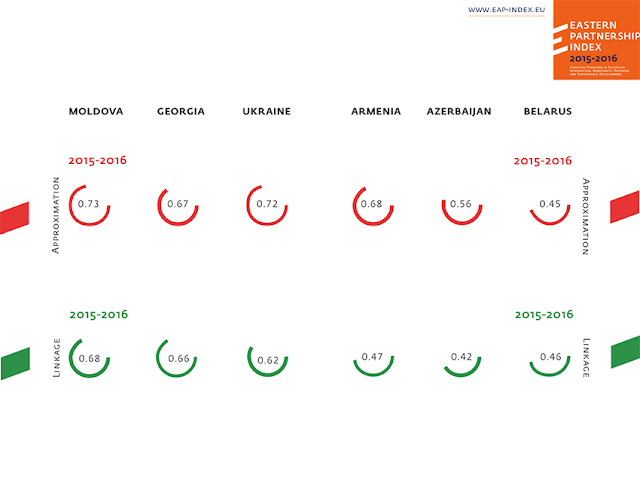 Moldova emerged as the frontrunner in the 2015-2016 Index, albeit with only a slight advantage over Georgia in Linkage and over Ukraine in Approximation. Moldova may not maintain that leading position in the Index, due later this year. Indeed, already the 2015-2016 Index shows that Moldova lags behind Ukraine and Georgia when it comes to International Security, Political Dialogue and Co-operation. While Ukraine had by far the most intense political dialogue with the EU, it also enjoyed the highest position in International Security, Political Dialogue and Co-operation, and held the lead in Sectoral Co-operation and Trade Flows. Moreover, the three Association Agreement signatories are not so far ahead of at least one of the other Eastern Partnership countries. The three were joined by Armenia as the leaders in Approximation to EU standards and international norms, a reflection of the progress that has continued in Armenia in spite of its government’s U-turn from signing an Association Agreement in 2014. Most tellingly, the Index reflects the need to fight state capture and to strengthen oversight (including by civil society and other independent experts) in Ukraine, Moldova, and Georgia. In Belarus and Azerbaijan, the EU must work for a place at the table for civil society, and apply diplomatic efforts to free political prisoners and foster an independent media. 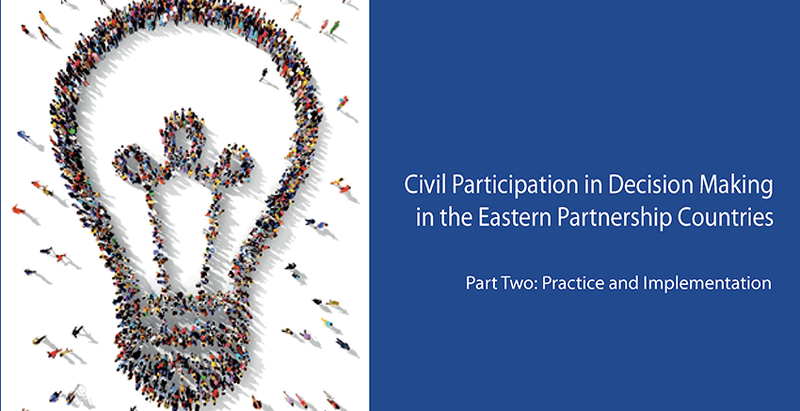 In Armenia, civil society has been vocal in its orientation towards the EU, and strengthened support from the side of the EU is key to the country's longer-term direction. The three South Caucasus countries and Belarus all have a significantly more favourable business environment than Moldova and Ukraine. Armenia leads in Sustainable Development, and had put in place a sustainable development policy co-ordination structure, although concerns persisted on deforestation, ineffective management of water resources, and weak pollution controls. Azerbaijan is placed fourth for Sectoral Co-operation and Trade Flows, ahead of Belarus and Armenia, a reflection of Azerbaijan's stronger trade ties with the EU since Azerbaijan is not a member of the Russia-led trading bloc, the Eurasian Economic Union. Belarus has the worst record among the EaP in Deep and Sustainable Democracy, including sixth place for independent media, and – along with Azerbaijan – for freedom of speech and assembly. Azerbaijan has the worst record in democratic rights and elections, including political pluralism. With the new methodology in place, together with the publisher, the Eastern Partnership Civil Society Forum, and the wealth of experts who work with us on the Index, we are planning the launch of the 2017 Index in September/October 2018. True, by then we will have had presidential elections in Armenia, Azerbaijan, and in October also Georgia, but key parliamentary elections in November in Moldova and parliamentary and presidential elections will follow in 2019 in Ukraine (of course, in either country, the elections might be brought forward). • strengthen the sustainability of new and existing independent media outlets? • establish and ensure the editorial independence and high-quality, balanced news programming of public service broadcasters? • raise the quality of news reporting and editorial and production standards at national and regional levels? New Diplomacy aims to contribute to raising the standards of reporting and to increase sharing of knowledge and news reporting skills across Eastern Partnership countries, and through the New Diplomacy Eastern Partnership Journalism Fellowship has in 2016/2017 placed journalists from Georgia and Ukraine in EU countries for five weeks in a placement in leading international broadcast or print media in those countries, such as German media, ZDF public television and Spiegel Online. The programme is supported by the US National Endowment for Democracy (NED). It can be hard to empathise with the messengers of the regime that annexed Crimea and threw Eastern Ukraine into a conflict that has cost thousands of lives, and displaced more than 1 million people – let alone those who defended the Kremlin's bombing of Aleppo. But two new, thoughtful pieces of analysis – without justifying either the actions of Vladimir Putin's Russia or glibly saying "Don't Shoot the Messenger" – pose the important question. Who will follow Vitaly Churkin, Russia's Ambassador to the United Nations who passed away this week? Likewise, who will succeed Sergey Lavrov, Putin's Foreign Minister who since the annexation of Crimea has seemed to be less and less convinced of the words of justification he seems compelled to utter? 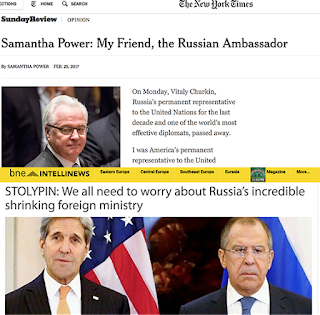 Samantha Power, who for the past four years was the Obama Administration's counterpart to Churkin at the UN, writing in the New York Times, makes a strong case for continuing close engagement with figures such as Churkin (although we don't yet know who will be his successor) – not least on the basis that he would often spend days trying to find a compromise on resolutions at the UN over Syria and other issues, only to have his hard work rejected by Moscow, compelling him to exercise the Russian veto in the Security Council. Just on the eve of Churkin's death, Mark Galeotti, writing for bne IntelliNews, raised a similar question, but about the other top diplomat of Russia – Foreign Minister Lavrov. Lavrov "has essentially been excluded from the inner circle setting foreign policy and is instead relegated to the role of articulating and defending an increasingly untenable and incredible official line," writes Galeotti. Real authority "has passed to 'adhocrats', figures made presidential plenipotentiaries regardless of their official role," he writes. There have long been rumours that Lavrov wants to retire, writes Galeotti, but "the wider implications are worrying," he writes. "FSB security briefings appear to have more weight than ambassadorial cables. The result is an impoverishment of policy." With the development in the first month of the Trump Administration that senior military staff were no longer core members of the US National Security Council, while Trump's Chief Strategist, ex-Breitbart News Chair, Steve Bannon, would be there, we were facing the prospect of "policy-setters" shaping the US security agenda without heeding the advice and reality check of military and security professionals. At least in the US, with the departure of Trump's initial appointee Michael Flynn, we now have in incoming US National Security Adviser Herbert McMaster a figure who is clearly not buying Bannon's populist agenda. In fact, the US foreign policy team (except the President himself) is beginning to look credible and professional – unlike his domestic policy team.